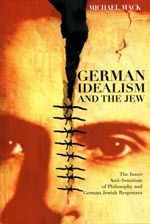 In Germain Idealism and the Jew, Michael Mack uncovers the deep roots of anti-Semitism in the German philosophical tradition, contending that the redefinition of the Jews as an irrational, oriental Other forms the very cornerstone of German idealism. He shows how fundamental thinkers such as Kant and Hegel created a construction of Jews as symbolic of the worldliness that hindered the development of a body politic, and how thinkers such as Moses Mendelssohn, Heinrich Heine, Franz Rosenzweig, and Sigmund Freud grappled with being both German and Jewish -pinpointing the particular Jewish notion of enlightenment that came out of it. The first analytical account of the connection between anti-Semitism and philosophy, German Idealism and the Jew speaks the unspoken in German philosophy, profoundly reshaping our understanding of it.